Spring 2011: Sheltered and Saved or Seduced and Stuck? Sheltered and Saved or Seduced and Stuck? When Can the Sanctuary Close? 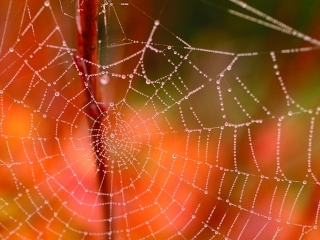 A spider once built a beautiful web in an old house. He kept it clean and shiny so that flies would patronize it. The minute he got a customer he would clean him up right away so the other flies would not get suspicious. But then he saw on the floor below a large crowd of flies standing around on a piece of brown paper. He was delighted! He was not afraid if lots of flies were doing it. So he came in for a landing. Well, you know what happened. That fly landed with the crowd of other flies and did the death dance. What’s the moral of the story? What does it profit a fly if he escapes the web only to end up in the glue? Who was sheltered from the flood? Was it the majority, too busy with all of life’s activities to really hear what the crazy boat-building preacher was saying? Or was it the minority: Noah and his family who listened to the voice of the Lord? See Luke 17:26-27 and Hebrews 11:7.
Who was in the right? Was it the majority of Babylonians and Israelites, bowing before King Nebuchadnezzar’s impressive golden image? Or was it the minority: Shadrach, Meshach, and Abednego who stood in faith for their precious Lord? See Daniel 3:15-28. Friends, what does it profit if we enjoy the temporary security of community, church, and tradition, but lose eternal life by choosing to go along with the majority that disregards the truths of God’s Word? See Mark 8:36-38. Another question that begs an answer: What will it take for a person to be in that faithful minority that is saved of God? In my estimation, if a person earnestly desires to avoid the deceptive flypaper of satanic lies that the majority of the world’s population gets stuck on (1 Timothy 4:1; Revelation 13:8), that person must pursue the fervent prayer-filled faith experience of which Jesus speaks in the first eight verses of Luke 18. From the message of these verses, it’s important to note that the saved minority will have a relentlessly unswerving prayer experience with God. Like the persistent widow in the parable who sought help from the unjust judge, like Jacob wrestling with the angel at Jabbok, they refuse to let go of Christ. See Luke 18:1-8 and Genesis 32:24-30. Nevertheless, when the Son of man cometh, shall he find faith on the earth? In order to have that undaunted prayer experience, those who remain true to God until the Son of Man comes will also have a very unique faith. I believe Christ is speaking here of the faith that He authored during His earthbound experience, the faith that kept Him true to His Father’s will all the way to His death on the cross. See Hebrews 12:1-2. Here is the patience of the saints: here are they that keep the commandments of God, and the faith of Jesus. There is a very vital point about saving faith that many people do not recognize: Faith is an incredible gift of God—the amazing ability to trust someone or something that we can’t verify with our senses! God has given every person on Earth a basic measure of this faith (Romans 12:3). But the power to exercise it is ours (Psalm 4:5). Because of this reality, every one of us must decide where we are going to consistently place this special gift. Will you put your faith in people and their wealth, wisdom, and strength, or in the Lord and His ways? If we want to put our full trust in the Lord, we must learn to trust Him habitually! The Lord will never manipulate or coerce our power of choice. Therefore, if someone truly desires to be like Jesus, and remain faithful to Him through the challenging “Gethsemane- like” experiences that lie ahead for the people of God, that individual must cooperate with the work of the Holy Spirit. Only through God’s help can this gift of faith develop into the same faith Jesus authored and finished in His time here on Earth. I am crucified with Christ: nevertheless I live; yet not I, but Christ liveth in me: and the life which I now live in the flesh I live by the faith of the Son of God, who loved me, and gave Himself for me. Notice whose faith Paul is living by—the faith of the Son of God. Now look close at Galatians 2:20 again: How could Paul live by the faith of the Son of God? Do you see it? Christ, the Son of God was living in him! We too must have the same experience. Jesus is the Author and Finisher of our faith (Hebrews 12:2). But since we can choose to place our gift of faith in other people or other things, we must be willing to cooperate with the Holy Spirit. Through Him we not only grow but, just as importantly, develop an eternal habit of keeping our faith in Christ and His will at all times and in all situations. We must learn, like the apostle Paul learned, to be content in faithfulness to Christ and His will regardless of circumstances (Philippians 4:11-13). With the gift of faith God has given you, study the Word of God to know Christ and His ways. By that gift of faith, contemplate Jesus’ responses to the people and situations God the Father allowed Him to experience. And by faith, practice Christ’s ways of responding by applying His ways to the similar life situations you face. As we choose to live by God’s will, we are cooperating with the Holy Spirit to develop Christ’s faith in your life. By faith, you are allowing Jesus, through His Holy Spirit to live His life in you. Forgive my redundancy, but please embrace this amazing reality: For every piece of the Word of God you embrace by faith you are actually instilling that part of Christ’s life into yours (John 6:63). That part of His life includes His faith, the faith He will return to find His true followers experiencing (Luke 18:8). It is faith in Christ that saves us, and it is the faith of Christ He lives out in our lives. What does the faith of Jesus look like? In whatever situations God the Father allowed Christ to experience, Jesus, by faith, chose to trust and obey God’s will (John 4:34; 6:38). He chose, by faith, to remain obedient to God regardless of the circumstances (John 14:31). If people were sick or in need, Jesus, by faith in God’s power, chose to do what He could to minister to them (Acts 10:38). If people questioned His position as the Son of God, Jesus didn’t argue, but by faith, chose to invite them to examine the evidence of His life (John 10:32-38). If He was accosted with ridicule or hatred, by faith in His Father’s care, Jesus chose to speak no words of self-defense or retaliation, but committed Himself to His Father in heaven (1 Peter 2:22-24). Christ’s example is an invitation for each of us to walk in His footsteps. And what happens as we, by faith, choose to diligently study and apply the Word of God in our lives? But whoso keepeth his word, in him verily is the love of God perfected: hereby know we that we are in Him. He that saith he abideth in Him ought himself also so to walk, even as He walked. This victorious faith comes from Jesus, through His Holy Spirit, living His life of faith in His sincere followers who are keeping all the commandments of God. This faith will protect us from landing in the sticky spiritual flypaper of end-time delusions the Enemy is casting out of his mouth to ensnare us. Returning to the original question: Who will be saved from the flypaper of spiritual delusions at the end of time? Will it be those who enjoy the fleeting security of the majority stuck on trusting the religious leaders of the day with all their self-made traditions? Or will it be the faithful minority, who cling to the promises of Scripture through faith and obedience to Christ? See Jeremiah 17:5-6; Matthew 15:8-9; and Revelation 3:10-11; 14:12. I’m sure you know the answer: It will be those who diligently study the Word of God in order to know God both intellectually and experientially (John 17:3). Moved by the transforming love of Christ (2 Corinthians 5:14-15), they will earnestly strive to continually practice responding to life situations the way Jesus did. Christians should be preparing for what is soon to break upon the world as an overwhelming surprise, and this preparation they should make by diligently studying the Word of God and striving to conform their lives to its precepts (626). Dear reader, I hope and pray that you will choose to be a wise follower of our loving Master regardless of the size of the crowd. My hope for you is that like Noah, like Daniel, like the great cloud of faithful witnesses, and like Jesus, you become committed to daily persevering prayer, diligent study of His Word, and earnest obedience. Seek to know Christ. This is how His faith is cultivated in our lives. But to trust and obey!